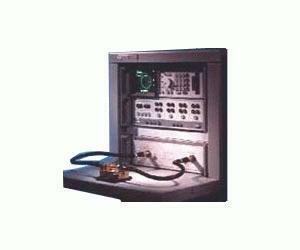 The Agilent 8510SX microwave vector network analyzer is a complete system configured with an Agilent 8510C vector network analyzer, a 26.5 GHz S-parameter test set, a 26.5 GHz synthesized sweeper, and a complete set of 3.5 mm measurement accessories. The instruments are integrated in the system rack prior to shipment from the factory. Installation is included at no additional charge. This preconfigured system is a complete solution for characterizing the linear behavior of either active or passive networks over the 45 MHz to 26.5 GHz frequency range. The Agilent 8510C displays measurement results in log/linear magnitude, phase, or group delay format on a large, color CRT with two independent, yet identical channels.